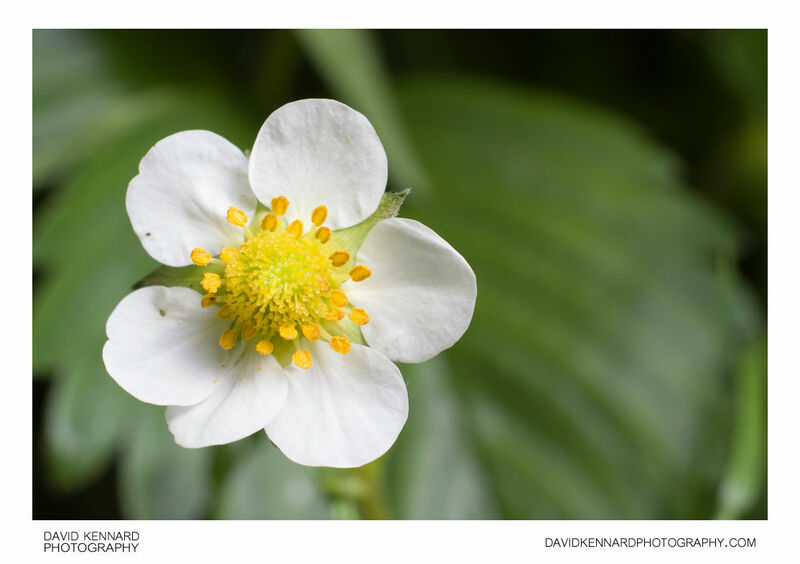 Close-up photograph of a Garden Strawberry (Fragaria × ananassa) flower. The flower usually has between 5-6 petals, with this flower having six petals. At the centre of the flower is a 'mound' of ovaries, with yellow stigmas sticking out. Surrounding this are the yellow pollen covered anthers. When the fruit develops, the ovaries develop into the seeds on the outside of the fruit. Strawberries are known as an aggregate accessory fruit as the fruit is derived from the receptacle that holds the ovaries rather than the ovaries themselves.